Facebook Inventory Integration allows you to display your entire inventory to your fan-base right on your facebook page. Your customers will never have to leave facebook, and be able to see your inventory including details and photos. Remember: Customers on facebook do not want to leave facebook. They trust facebook and do not intend to leave it for your website. 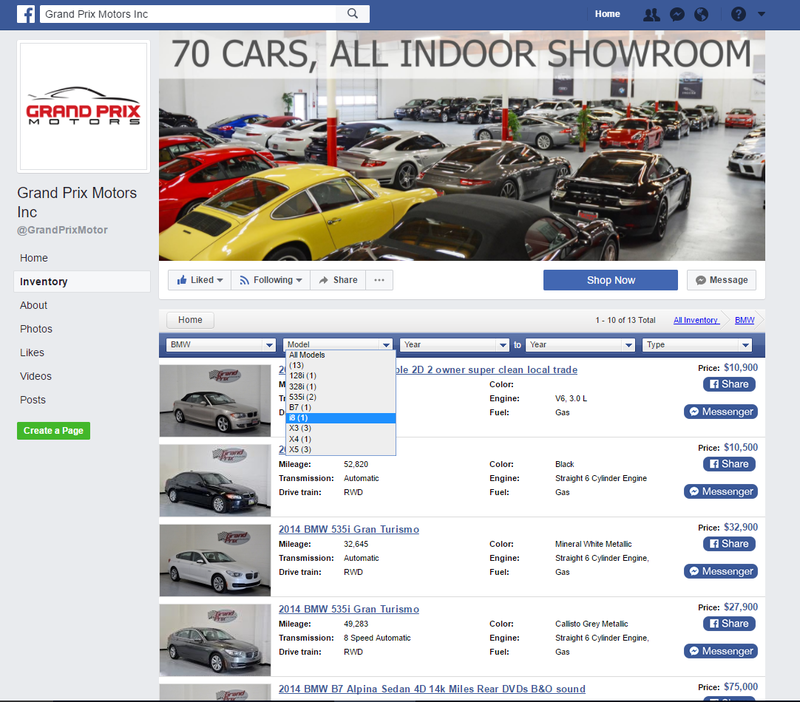 Displayig your inventory directly on facebook is a no-brainer for any auto dealership. Intelligent Auto-Posting has never been more sophisticated, innovative and efficient. Our special algorithms, took countless R&D hours to ensure your vehicles stay at the top of Craigslist, while keeping your Craigslist ad budget at a minimum. Ask yourself: is it in their benefit to post efficiently for me? Is it in their benefit to post more than I need? Is my current Craigslist vendor on my side? Or are they looking out for themselves? Our state-of-the-art intelligent autoposting system is not a gimmick. It is a carefully formulated, self-adapting mathematical formula that keeps your vehicles at the most optimal visible space on Craigslist, while keeping your $5 per ad budget at a minimum. Yes - we are on your side! Many autoposting companies claim to have intelligent auto-posting to Craigslist, but in fact, we have analyzed their method of posting and we can clearly see - just, randomness. 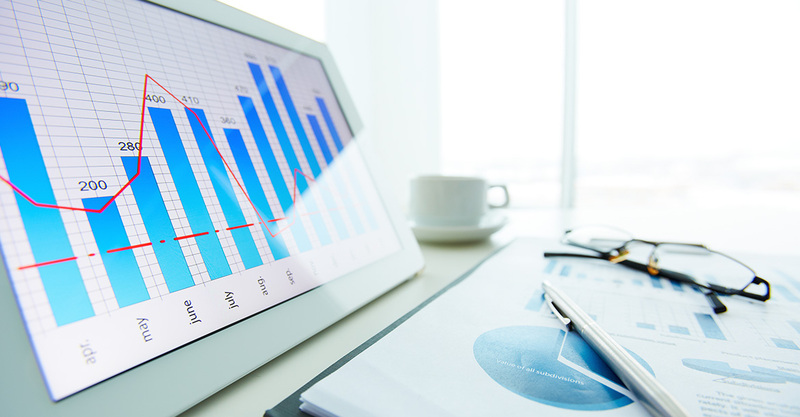 Advanced reporting can help you properly fine tune your dealership's marketing efforts. Without proper reports, it is like shooting a dart blindfolded. Our CMS reporting provides your leadership team to make accurate decisions that can pay dividends in the short and long term future of your business. Dealership IDS was able to give us easy to read, applicable leads that we use on a day-to-day basis. This helps us fine tune our Craigslist campaign and allocate the appropriate budget per season depending on our sales history. Having intelligent phone numbers and call tracking is a pivotal variable in any Craigslist campaign for any business. Without call tracking, you may never really know or understand which vehicles customers are inquiring about. Call & Text tracking is also a way to keep salespeople accountable as it provides upper management the ability to review and document leads that convert and leads that are lost. Is your Inventory Intelligent? How do customers search for your Mercedes? Do they search Mercedes-Benz or just Mercedes? The technical model name for a Mercedes C300 is actually "C-Class", but is having the term "C-Class" in your craigslist ad any benefit to you? Do people really ever search C-Class? Where else is this anomaly and failure happening in your inventory feed? Ask yourself this question; a customer who searching for a Honda Accord, may they also be interested in your Toyota Camry? There are true relationships between cars, across different manufacturers and their models. An Accord is like a Camry, and a Camry is like a Maxima. Is your inventory self-aware of its relationships across multiple manufacturers? An industry leader in of web automation & data reconseliation. Landing Pages are an extremely useful tool to take your customer away from Craigslist, which is filled with your competitors, into your own private site where the customer can see only your vehicle and others vehicles you carry. Customer Relationship Management is an essential asset for your business. As your leads flow in from multiple sources, they become more difficult to track. Many prospects and potential sales can fall through the cracks. 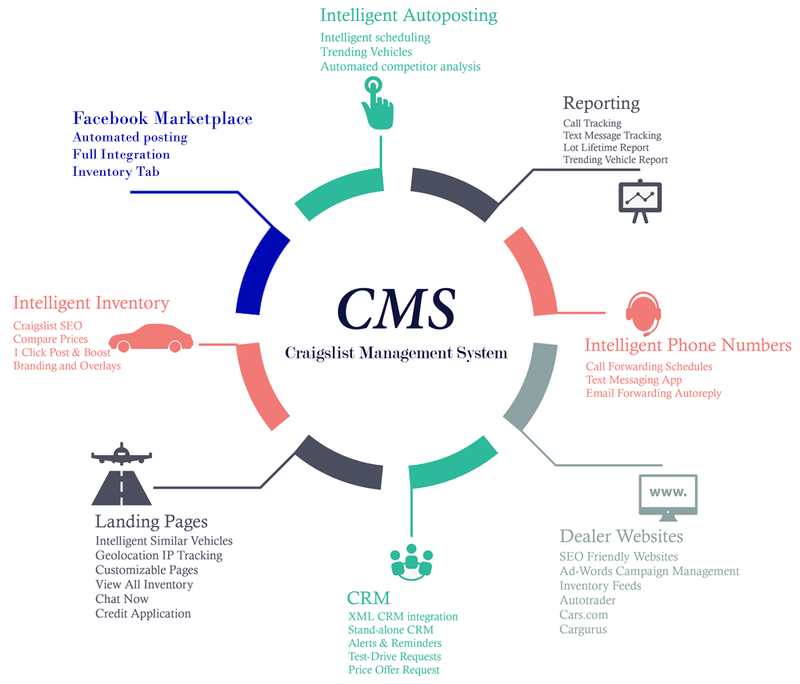 Dealership IDS has a built-in CRM specifically designed to capture your Craigslist leads, or we can seamlessly integrate with your existing CRM provider. Your dealership's website is not only a lead capturing tool, but also the business card that legitimizes and brands your dealership. Call us to compare your existing website to see the benefits of a website with Dealership IDS.